TSA has launched a pilot project on a Trusted Traveler program in cooperation with U.S. Customs and Border Protection. The pilot, announced on July 14, is set to begin this fall. The pilot project will initially be limited to a small group of frequent fliers of American Airlines who are flying out of Atlanta and Detroit airports, and of Delta airlines, flying out of Miami and Dallas airports, CNN reported. Although TSA has remained tight-lipped about the program, eligible participants in the project will be able to skip some of the most aggravating features of modern airport security procedures, including removing shoes. They will also likely be able to skip the controversy-raising full-body imager and walk through magnetometers instead, CNN reported. The trusted traveler program would allow officials to focus security to high risk areas and expedite the screening of trusted individuals. CBP’s Global Entry pilot program has been operating since June 6, 2008 on 20 airports, and is set to become a permanent program based on its success, according to the CBP website. The program is open to U.S. citizens, lawful permanent residents, Dutch citizens and Mexican nationals. 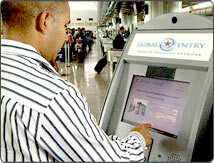 Global Entry members save time by checking in at automated kiosks, skipping the time-consuming processing lines. Kiosks are available in most major U.S. airports, including Washington, Houston, New York, Los Angeles and San Francisco, according to the website. Canadians who are members of CBP’s NEXUS program can also take advantage of the Global Entry kiosks. NEXUS cards provide expedited travel via land, air or sea between the U.S. and Canada border. The SENTRI program, whose members also enjoy Global Entry benefits, offers expedited processing to travelers heading over the U.S.-Mexico border. Applicants to the program undergo extensive security measures, including a thorough background check, law enforcement check and a personal interview with a CBP officer.